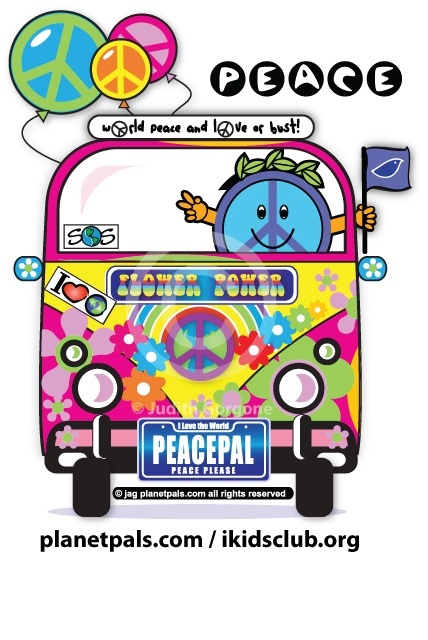 Happy Peace Day Peace Pals! 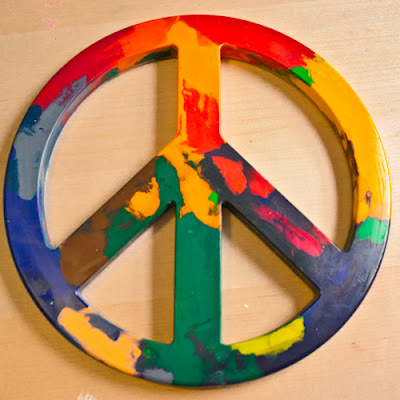 Let's Make The World In One PEACE! Learn more about peace, activities, games, ideas, solutions, history, more. 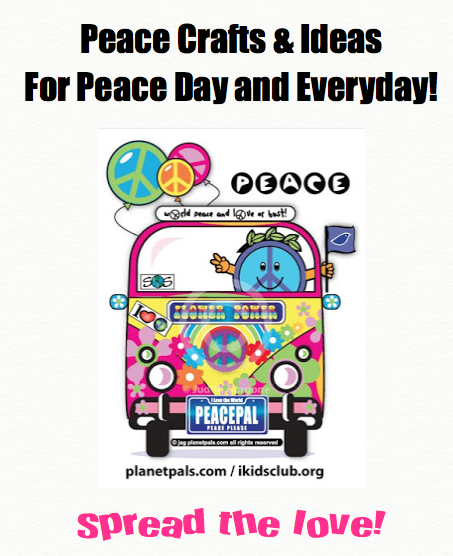 Labels: peace day , peace day ideas , teach about peace. 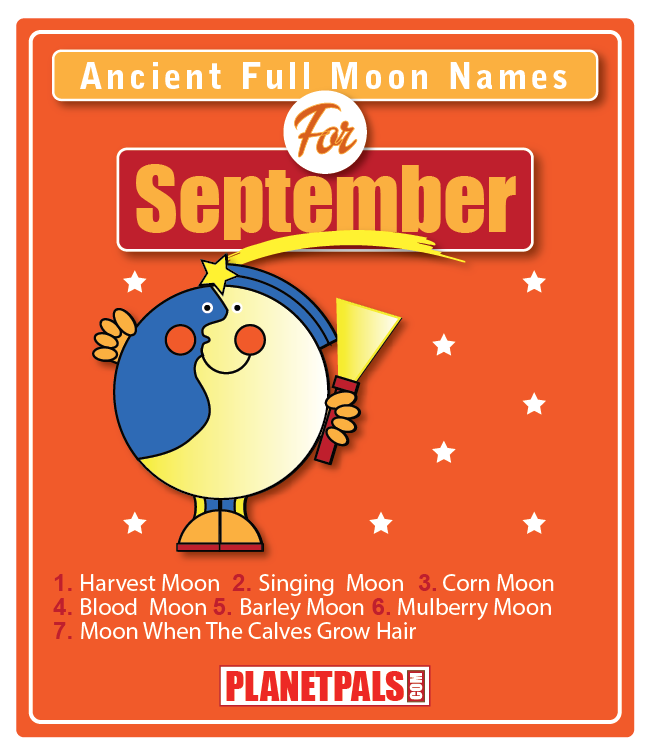 This months full moon is September 16, 2016 @ 3:05 EST. It's a LUNAR ECLIPSE – FULL MOON in the Astrological sign of Pisces. The Ancient Full Moon Names for September are: Harvest Moon, Singing Moon, Corn Moon, Blood Moon, , Mulberry Moon, Chrysanthemum Moon, and Moon when the calves grow hair. Make National Play Doh Day Natural Play Dough Day! 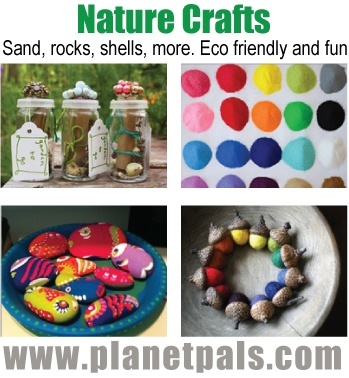 Why not try making natural Play Clay at home and bring home a healthy message. 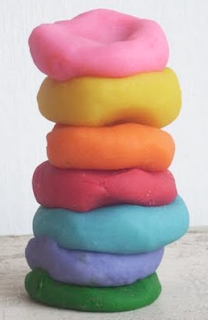 National Play-Doh Day celebrates a great childhood play toy on September 16. Invented in the mid 1950s, it has entertained millions of children, and allowed them to express their creativity, both at home and in the classroom. The original invention was simple. 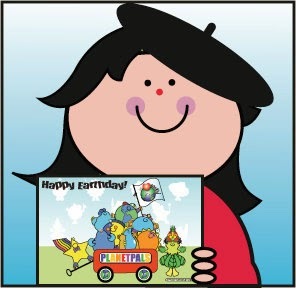 A school teacher wanted a safe modeling clay for her pre-schoolers. 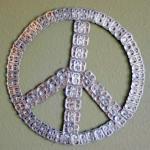 She asked her brother-in-law Joseph McVicker, who worked at a chemical company, to come up with something. The result was simple....flour, water and food coloring. You can do the same at home -- and it is healthier! 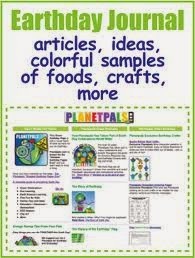 Check out the variety of simple play clay recipes (there are cook and non cook, flour and corn starch recipes, and more) available on Planetpals.com with some ideas and patterns to help you teach healthy living, too. 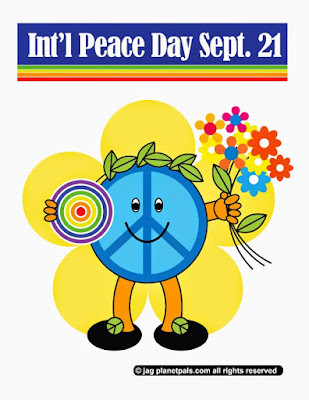 September 22 is International Peace Day and what better way to celebrate than participating in some peaceful activities and peace crafts. 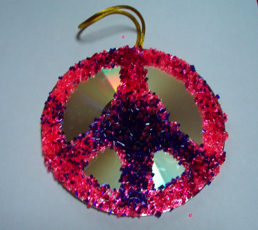 Peace Day Crafts Even You Can Do! 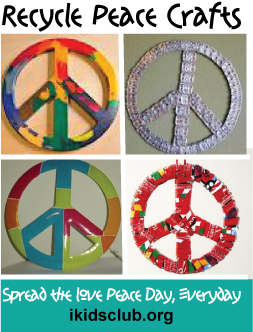 Take a look at these unique recycle craft ideas we have for you for Peace Day. 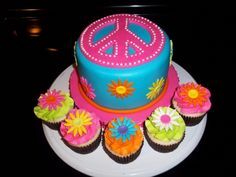 Make one for yourself and spread the peace to a friend (or two)! 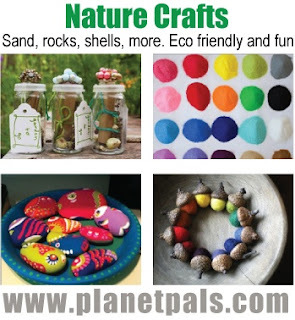 For additional peace crafts follow us on Pinterest, Facebook, Twitter and go to the peace crafts section of Planetpals Website. We add them all the time. 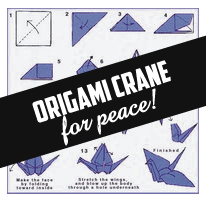 From Ikidsclub Peace Website Make an origami Peace Crane and participate in the 1,000 cranes for peace project ! 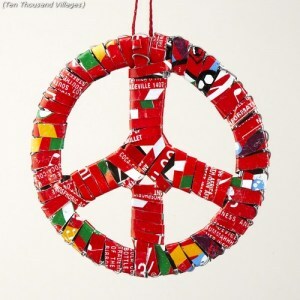 Cut out a Peace Sign and wrap it in wrappers, magazine pages etc. This one is wrapped in can strips-but we don't recommend that for children! 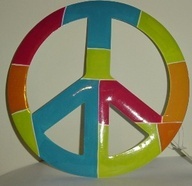 From Craft Knife a simple idea for melted crayons Peace Sign. 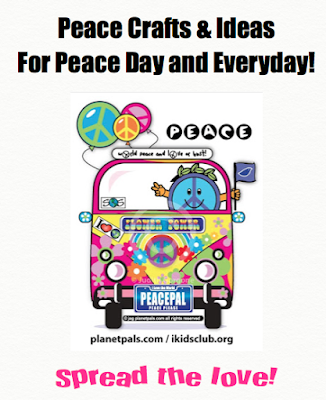 Looking for Classroom ideas, history and lesson plans to celebrate Peace Day? IKC has is all! 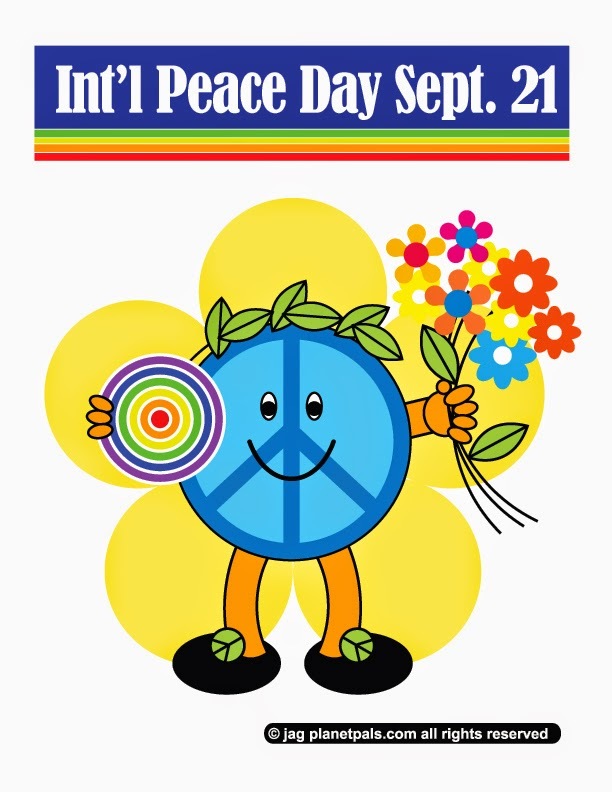 Read these enlightening and fun ideas for peace in this International Peace DAY article, too. 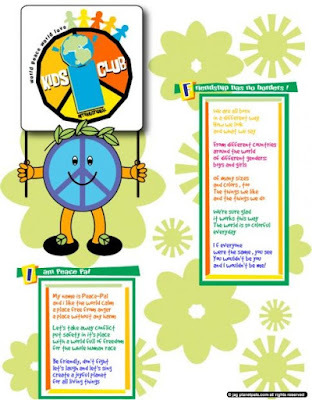 Great for the classroom! 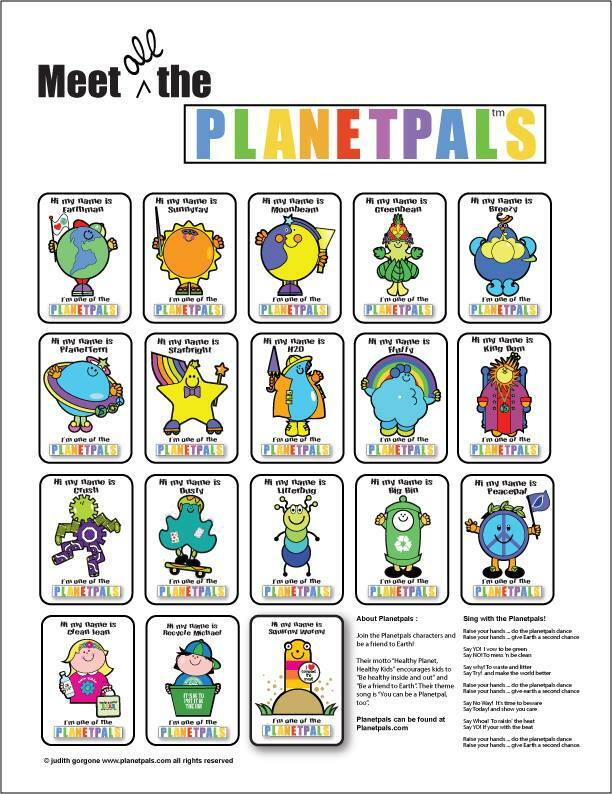 © jag Planetpals.com all rights reserved! 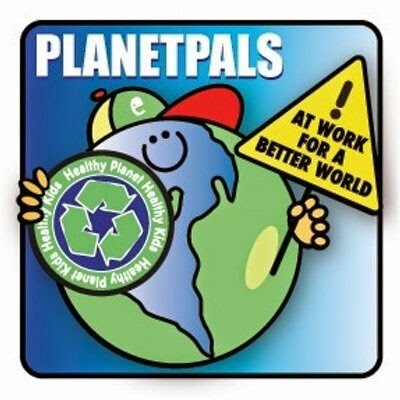 Divert thousands of tons of trash from a landfill while shopping green. 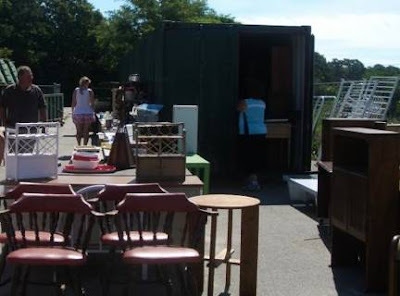 All over the country towns are implementing "Swap Shops" at town transfer stations or recycle centers. 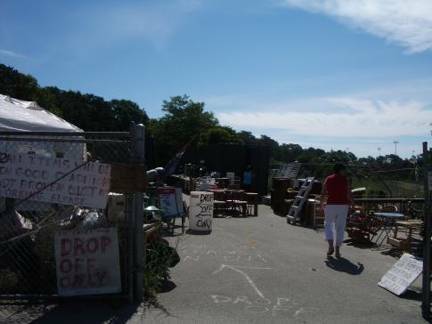 They make so much sense, that I haven't figured out why every town in the US does not have a swap shop! It's a no brainer, because it not only diverts trash tonnage from landfills, but it adds up to savings on town disposal costs. 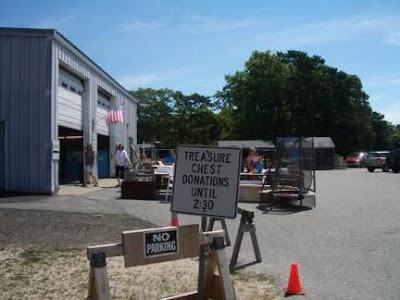 For instance, the town of Dennis, MA diverts 56% of it's residential solid waste from the landfill due to their Swap shop "Take it or Leave it". 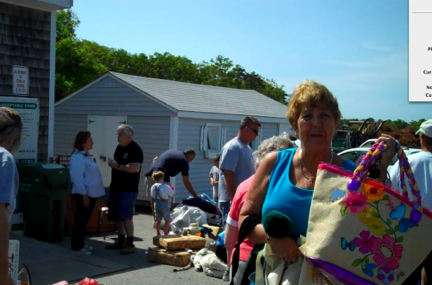 What is a swap shop? 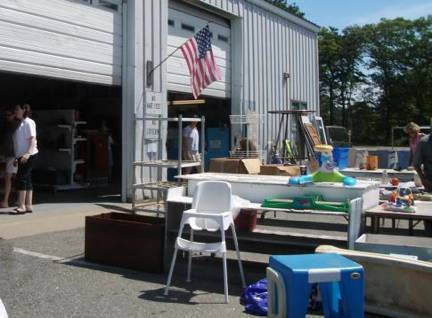 A town swap can be a recycle center for just about everything. It's a put and take: a place to bring items and a place to shop for them for free. Each town runs theirs differently, some towns have only single book swaps or computer swaps. 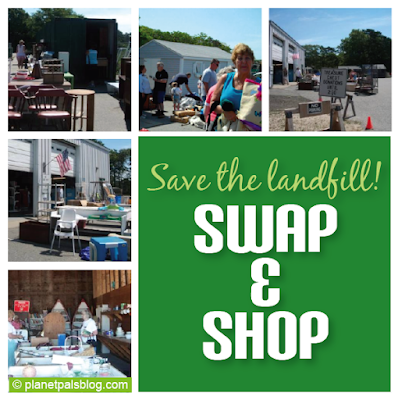 But many towns have swaps for every recyclable category, often housed in multiple buildings or recycled trailors. 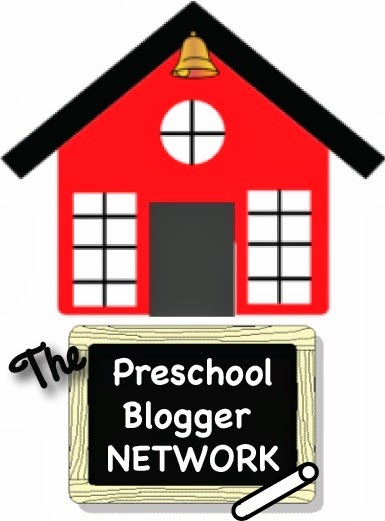 Many are well organized and categorized just like stores and libraries. Some buildings even have background music! 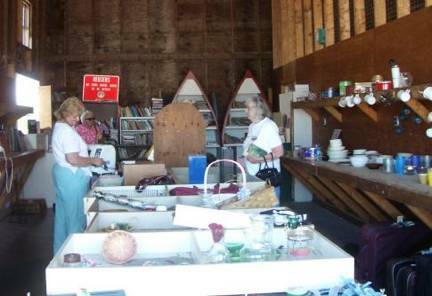 Many swap shops are maintained by city employees and others manned by volunteers. 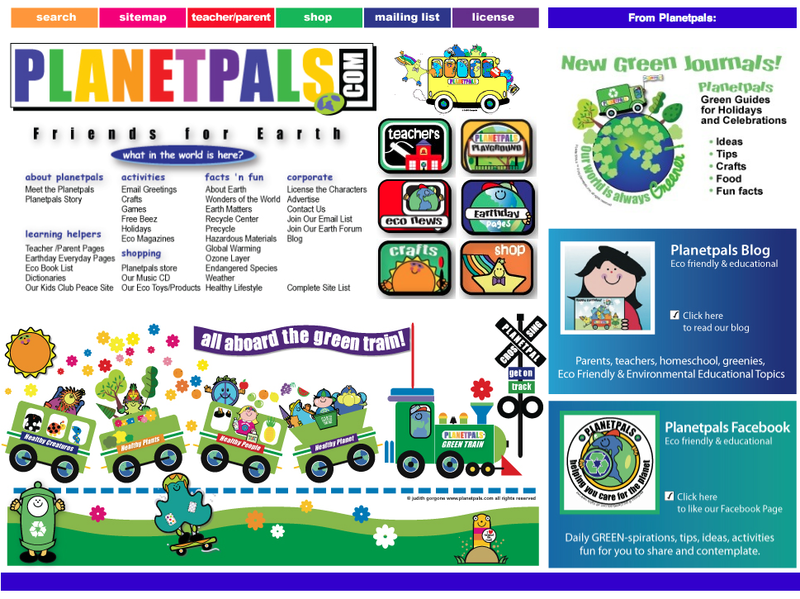 What amazes me, is how much stuff actually gets reclaimed, reused, repurposed and saved from landfills. It seems that people find use for just about anything. Residents can not only reclaim standard items such as clothing, kitchenware, furniture, sports and gardening equipment, but also reuse building materials. No matter how the shops are configured, they have one thing thing in common, and that is that they give new life to tons of old objects and recycle it all. Items go as quickly as they come in! Why doesn't every town have one? Every town has a small space that can be allocated for this project, but many towns do not consider them important enough. My town had a book swap and a computer electronics area for several years, but recently closed them down, mainly because they didn't want to be bothered. It's a shame, because residents are often too overwhelmed, incapable or ill informed to find someone to take their stuff away and more often end up just tossing it into the trash. Hence, it goes to a landfill and much of it will never biodegrade. So, whether the swap shops are affectionately named "Town Mall", "Put n Take", "Last Chance" or "Treasure Chest", it's a concept that not only saves the residents and the town, but saves the planet! If there is no swap shop in your town, why not take action and talk to your DPW or recycle committee. 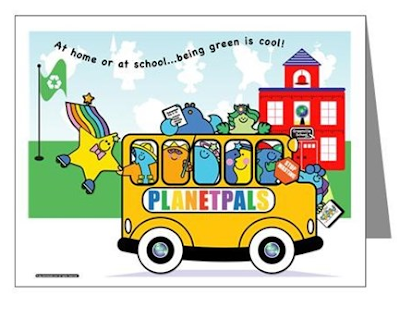 It's good for the planet and greener in many ways.